In addition to the time travel novel (Breathing Ghosts) I’m writing, I’m also working on a steampunk urban fantasy. It is yet unnamed, but I’m piling everything I think is cool about steampunk into it. In addition to the goggles, airships, and steam-powered machines, it will also contain magic. I have this idea for a Lovecraftian world of ancient monsters and magic – basically the place where all our world’s legends began. 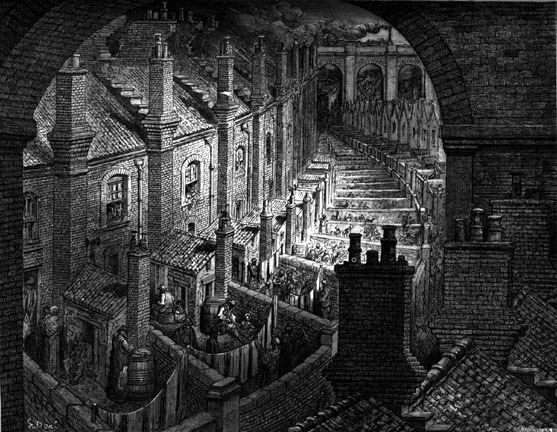 Victorians have managed to create a Gate into this world, and colonized/subdued it with brick, technology, and social mores into a semi-civilized place they call “New London”. They are happy to use the inherent magic as another sort of power/science. But when the Gate unexpectedly closes, the people trapped on New London discover their transported science and technology is dying, and the ancient magic of the world beneath New London is rising up against them…. I just love how cramped and…brick…it all is. If you were an ancient Lovecraftian beastie, wouldn’t you rise up against this?